Multi level marketing is something a lot of people are interested in today. This is particularly true nowadays with the high unemployment rates. Because a lot of people are either out of work or at risk of getting laid off, they are starting to look for other sources of income. Multi level marketing is something they often turn to. Every company has a slightly different system, so the exact formula is slightly different from one to the next. However, no matter which firm you work for, the main goal does not change. In any case your objective is to generate leads and follow up with them and sell them on the company’s product or services. In most instances you will also try to get them to join the business as a reseller, and market the products themselves. Some companies focus more on the business opportunity rather than the product or service itself. In other words, you are either trying to sell them on the opportunity, the product, or both. No matter what the target is, you have to sell them somehow. With many companies, you achieve this by getting the lead to attend a company conference call, where they will listen to a description of the product or service, and the business opportunity behind it. After this, you follow up with them over the phone, answer their questions, and attempt to sign them up right then and there. Multi level marketing offers something no job today does-passive income. You can earn money whether you are working or not, which is something you could never do with a job. 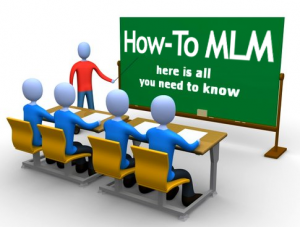 If you are tired of working at set times everyday, you might be interested in Multi Level Marketing. This is because multi level marketing offers the ability to set your own hours. After all, all you have to do is generate leads and follow up with them. This can really be done at any time. If the company has conference calls you have to send the prospect to, then obviously you will have to be available during and after those calls. However, for the most part you work when you want. Some people are able to generate a 6 figure income working only 15-20 hours a week. No matter which company you join, you need to know a lot about sales and marketing to make this work. In particular, you really want to focus on learning over the phone selling, copywriting and traffic generation. Your goal is to generate leads, and this will usually be achieved through a website. Your focus is on getting the lead’s name, email address and phone number. Once this is achieved, you should develop an auto-responder series to send to them, so you stay in their mind. Make sure you also follow up with them over the phone, and get them to a conference call (if the company has one). Generally you will get a script from the company to follow when doing this, so your job is simply to stick to it. Just make sure you get in a conversation with the lead, and do not merely sell to them. Ideally you should pre-qualify them before you get them to come to the conference call. In other words, make sure they have enough money to join the opportunity, and enough time to devote to it. Some people make the mistake of trying to get every lead to a conference call, but this approach is not effective. When following up with them after, again make sure you allow them to ask you questions, and you respond to them. If you just launch into an attempt to get them to signup without giving them the opportunity to ask questions, you will not be successful. Multi level marketing can be very profitable when done right. Use these tips, and you will become successful shortly.